Syrian troops have reportedly entered the city of Homs, the country’s third largest, bringing with them tanks and heavy weaponry in a bid to clamp down on protesters. 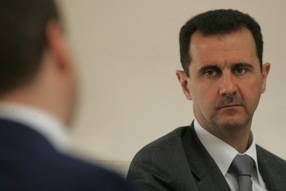 The crackdown is the latest in a series of harsh measures by the government of President Bashar Assad, whom many are calling upon to step down. According to human rights groups, two people were killed and 20 more injured. According to an Associated Press source, “[C]lashes occurred after security forces killed on Sunday the son of an anti-regime tribal leader. The unrest lasted until 5 a.m. (0200 GMT) Monday.” Independent journalists are not allowed inside Syria to cover the protests. President Assad’s crackdown has been accompanied by several attempts at placating opponents, including allowing several days of talks by opposition groups, which were boycotted by several key factions. Though no official figures are available, activists estimate that some 1,600 people have died since the protests began four months ago. Witnesses also said pro-government demonstrators targeted the U.S. Embassy in Damascus, smashing windows and leaving graffiti. The French and U.S. ambassadors visited Hama, an opposition-friendly city, last week, enraging government supporters. 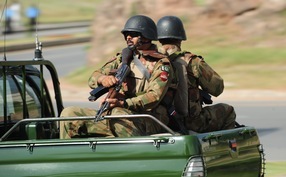 Despite an $800 million reduction in U.S. military aid to Pakistan, an army spokesman told the BBC that its ability to fight extremists groups will not be diminished. The announcement came amid worsening relations between the two allies, strained in part by the raid that killed Osama bin Laden on Pakistani soil, which was conducted without advance notice. The United States provides Pakistan with billions of dollars in aid money each year; the $800 figure accounts for roughly one-third of the military assistance package. For its part, Pakistan has expelled some military trainers on its soil and vocally criticized U.S. drone attacks targeting tribal regions near the border with Afghanistan. (Read more: Reuters’ Q+A: Worsening ties between Pakistan and the United States). Newly sworn-in Defense Secretary Leon Panetta is in Iraq Monday following a stop in Afghanistan. He is planning to meet with Iraqi Prime Minister Nouri al-Maliki to discuss the possibility of discussing an extension of U.S. troop presence in the country beyond a planned withdrawal at the end of this year. Secretary Panetta expressed frustration with the process, telling troops, “Do they want us to stay, don’t they want us to stay? Do they want to get a minister of defense or don’t they want to get a minister of defense?” There are still 46,000 U.S. troops remaining in Iraq. Panetta later qualified remarks about 9/11 after telling troops, “[T]he reason you guys are here is because on 9/11 the United States got attacked, and 3,000 not just Americans, but 3,000 human beings got killed, innocent human beings, because of al-Qaida.” Panetta said he wasn’t talking specifically about what prompted the invasion, but was instead referring to the need to discuss the broader threat posed by al-Qaida. During his visit, several rockets hit the Green Zone in Baghdad, wounding several civilians. Such attacks are fairly common, and Monday’s incident did not take place near the U.S. Embassy. Panetta’s visit comes after a high-level shuffle on the president’s national security team. Gen. David Petraeus, the top commander in Afghanistan who will now head the CIA, expressed confidence as he prepared to leave the country after his tour, calling the mission of securing Afghanistan “very hard, but it is doable.” He said he expected hard battles over the coming year as the 33,000 troops from the “surge” in Afghanistan begin withdrawing. The death toll continues to climb after a ferry sank on the Volga River Sunday. At least 41 are dead, but 80 people remain missing as rescuers continue to search for victims. News reports suggest 208 people, including children, were onboard a vessel licensed to carry 120. President Dmitry Medvedev declared a day of morning Tuesday and ordered an inquiry into the cause of the sinking, which reportedly took place as the ferry made a turn and was leaking fuel. The Bulgaria was 56 years old and operated by a tourism company. According to Russian officials, it had not undergone repairs in more than 30 years. “[I]t is clear that such an accident couldn’t have taken place if safety rules were followed, even despite the difficult weather situation,” Medvedev said.